Bubbles LOVES bread. Have I ever shared that here? She absolutely loves it, and has been known to forgo proper meals for a slice of bread. With that in mind, I have been experimenting with homemade bread. There are few things that spell both home and comfort, and the aroma of homemade bread wafting from your kitchen is one of them. Knowing what goes into each loaf gives me comfort on another level too, as I know much of it will go into my baby's tummy. 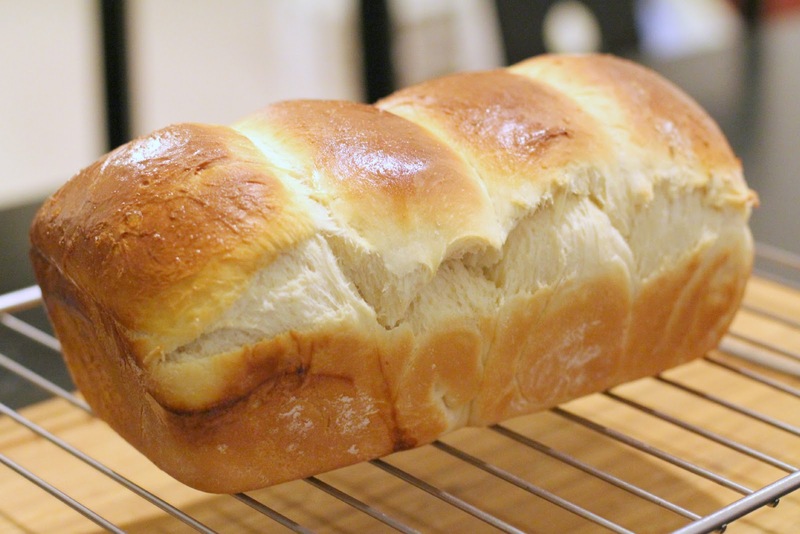 After baking up a few different types of bread, including this pretty-looking one, I discovered the Tangzhong Method. I will not go into details here, as there are many websites that describe more fully what it is about. Basically, it is a method that requires a simple roux of sorts to be made beforehand, and this special (magical, almost) roux creates breads that are super light and fluffy. Breads made from this method are often described to be like those from 'Asian bakeries' - where you get fluffy buns and loaves. To me, it is similar to brioches, although I have not read enough to know where the similarities end. So, while we also enjoy heavier, rustic, country-style loaves, I was thrilled to be successful with the Tangzhong Method, using Christine's Recipe as a basis. I baked loaves of white bread. My tin is too small for the recipe, so the bread turned out denser than it should, but still soft and yummy. I made a loaf for a small pot-luck dinner with another family. It went surprisingly well with Oxtail Stew! 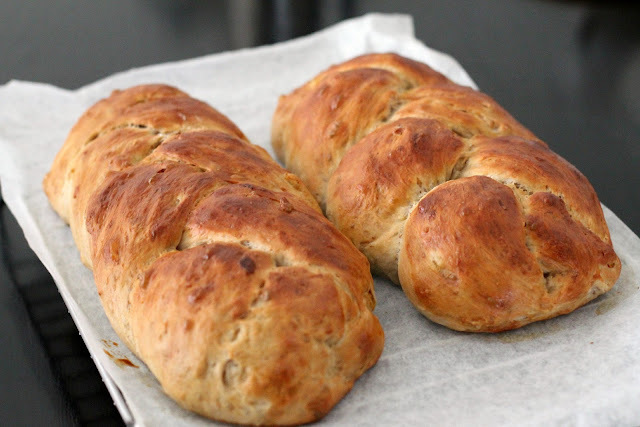 I also baked these delicious Braided Raisin Walnut Loaves. The only change I made in the recipe was to replace rum with prune juice. It turned out really well! Yes, that is what little hands do to freshly baked bread. Joy. Chomping chunks of homemade bread still warm from the oven. 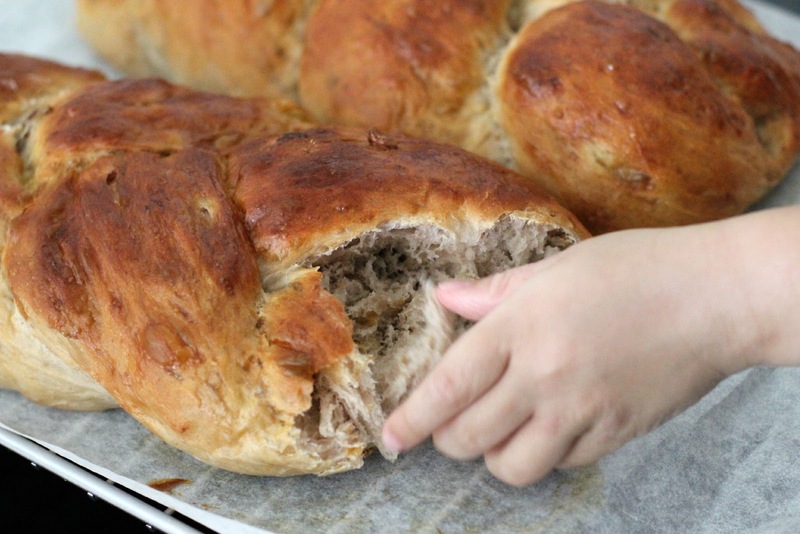 The Tangzhong method really works in getting soft, fluffy breads. I must say that the end products are so very pretty too! The only downside to the Tangzhong method is that the dough is extremely wet and sticky. While I do not deny that you can probably hand knead it from the start, I do not have the luxury of time to do so. I used a dough hook of a (hand-me-down) handheld mixer to knead my breads. Sadly, my hooks actually BROKE during the mixing of the Raisin-Walnut loaves you see above. I was too excited to make these breads that I did not consider my old mixer's lack of power. So. No more pretty Tangzhong breads until I get a proper stand mixer. To save $$, I have been scouring forums for a 2nd-hand one. Do drop me a mail if you have a decent one to sell!